Water impact test of an 18,000-pound (8,165 kilogram) test version of the Orion spacecraft dropped from 25 feet (7.62 meters) at NASA’s Langley Research Center on Wednesday, Sept. 12, 2012 (Credits: NASA). 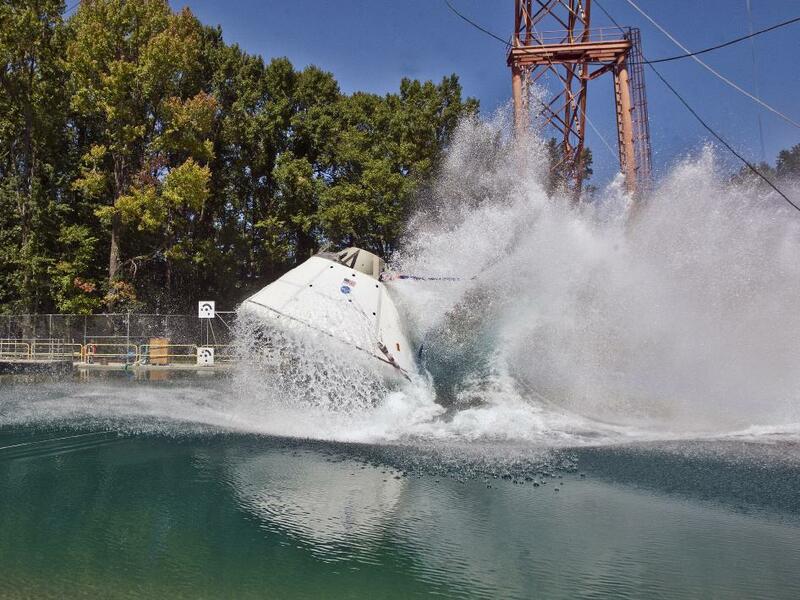 The 18,000-pound test article that mimics the size and weight of NASA’s Orion spacecraft crew module recently completed a final series of water impact tests in the Hydro Impact Basin at the agency’s Langley Research Center in Hampton, Va. The campaign of swing and vertical drops simulated various water landing scenarios to account for different velocities, parachute deployments, entry angles, wave heights and wind conditions the spacecraft may encounter when landing in the Pacific Ocean. The next round of water impact testing is scheduled to begin in late 2013 using a full-sized model that was built to validate the flight vehicle’s production processes and tools. Orion will carry astronauts farther into space than ever before and be the most advanced spacecraft ever designed. It will fly its first flight test, designated Exploration Flight Test 1, in 2014. The spacecraft will travel more than 3,600 miles into space — 15 times farther from Earth than the International Space Station — and reach speeds of more than 20,000 mph before returning to Earth. This unmanned flight test will launch from Cape Canaveral Air Force Station in Florida. Several Orion systems, including the heat shield and parachutes at speeds generated during a return from deep space, will be tested. In 2017, Orion will be launched by NASA’s Space Launch System (SLS), a heavy-lift rocket that will provide an entirely new capability for human exploration beyond low Earth orbit. Designed to be flexible for launching spacecraft for crew and cargo missions, SLS will enable new missions of exploration and expand human presence in the solar system. Langley’s Hydro Impact Basin is 115 feet long, 90 feet wide and 20 feet deep, and is located at the historic Landing and Impact Research Facility where Apollo astronauts trained for moonwalks.